Dr. Luke Donovan is an Assistant Professor in the Department of Kinesiology at the University of North Carolina at Charlotte. Prior to coming to UNC-Charlotte, he was an Assistant Professor at the University of Toledo and served as the Director of the CAATE-accredited Post-Professional Graduate Athletic Training program. Currently, Dr. Donovan teaches within the undergraduate Athletic Training and Exercise Science Programs and advises students within the Interdisciplinary Biology PhD Program. 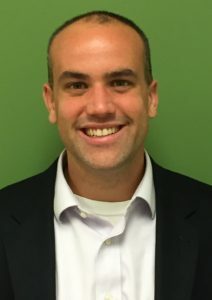 Dr. Donovan’s research interests includes the utilization of an impairment-based rehabilitation model for the treatment of chronic ankle instability, in which he is further refining the model by studying novel assessment and rehabilitation techniques. The David H. Perrin Doctoral Dissertation Award, NATA Research and Education Foundation, 2017. Torp DM, Thomas AC, Donovan L. External Feedback during Walking Improves Measures of Plantar Pressure in Individuals with Chronic Ankle Instability. Gait & Posture. 2018. Donovan L and Feger MA. Relationship between ankle frontal plane kinematics during different functional tasks. Gait & Posture. 2017.